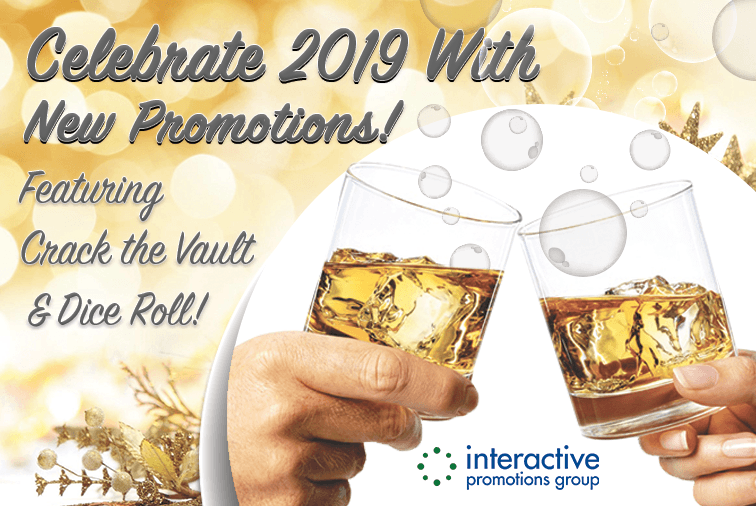 Celebrate 2019 With New Promotions! On the 31st of December, New Year festivities begin around the world. New Year traditions are designed to bring luck and good fortune for the year ahead. With Interactive Promotions, we offer your customers or fans with the opportunity to celebrate the start of 2019 with the possibility of attracting big fortune. If growing in sales and customers is apart of your company’s resolution, check out some of our New Years inspired promotions below. Ring in the New Year with our NEW & IMPROVED Crack the Vault promotion! This is perfect for any event with a large crowd. We now offer Crack the Vault in various display options – your contestants can play using a hand held device, a kiosk stand or physical vault. Roll some excitement into the New Year and into your next promotion! Give your patrons the chance to win big by rolling “2-0-1-9-!”. If they are lucky enough to roll the correct phrase, they walk away with up to $25,000! Start the year off with setting up a plan for profits. Build brand awareness, generate new customers and leads, and ultimately getting your business sales in the busiest time of the year. For more information on our contests and coverage options, give us a call at 888-882-5140.